The St. Thomas Tommies have added former Saint John Sea Dog Ian Saab for the second half of the AUS season. 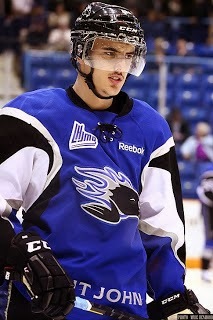 The rugged defenseman has played his past four seasons in the QMJHL for Saint John, Lewiston, and Cape Breton. Known primarily for his solid defensive play, the 6'1" Halifax native is by all accounts a great team mate and should blend in well to the Tommies defense first approach employed under Head Coach Pat Powers. Ian has also played with a handful of current STU players including Spencer MacDonald, John MacDonald, Jordan Thomas, and Jordan Moore. Look for Saab to play a tough "look after your own end first" type of hockey game. He has a mean streak a mile wide and doesn't have a problem bringing the dirt when he needs to.